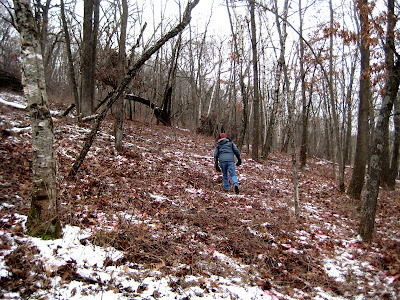 The New Year's Day ski/snowshoeing event is canceled due to the lack of snow! The last three winters we have had lots of early December snow which stayed and stayed, making a New Year's ski/snowshoe event possible. One tends to forget that southern Wisconsin is not really in the "snow belt". Bits of light snow here and there. Lots of very cold days in January and February. Perhaps some huge wet snows in the spring. (The night my daughter Emily was born, Apr. 9, 1973, we had almost two feet of heavy wet snow. The whole city closed down.) But snow that provides for predictable cross-country skiing/snowshoeing is rare. That's why they hold the Birkebeiner race in Hayward. I delved through my hard disk and found lots of snowless winter photos for Pleasant Valley Conservancy, such as the one shown here (taken January 3, 2007). In those years, we got used to doing most of our brush cutting in the winter. The snowless December has been fantastic for work in the woods, and Amanda has been making nice progress. The photo shows an area that has just been opened up. The faint red color is not some Photoshop finagling; it is due to the red dye used with the Garlon 4. Dozens of stems, large and small, were cut with a brush cutter, and treated with herbicide. All the cut branches were turned into a brush pile (just out of view to the left). In order to provide more detail of the 1937 air photo, I have posted it at a larger size than usual. Click on it to bring it up to size. We have a lot of work to do in this area, which is around 10-15 acres. This is a photo Amanda took Wednesday when she was getting ready to start work. Quite a bit different weather from what we had in Madison (where there was just a light snow). This is a view of the south-facing slope (Unit 6), looking up toward the Rocky Overlook. 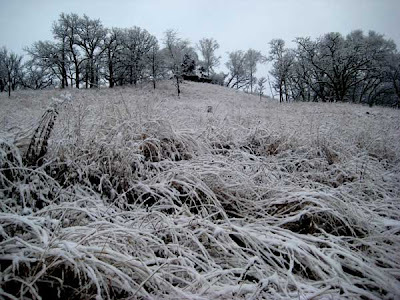 I love to see the tallgrass prairie weighted down with ice crystals! Amanda is also reporting seeing eagles every day: "I did get to see 3 eagles today! One soared over me as I was getting out of my car this morning and then looped back and forth over the valley. The other two were in a pair and soared over the cabin before landing on the other side of the valley." We rarely see eagles in warmer weather, but since we are about ten miles from the Wisconsin River, it is probably not surprising that we are seeing them now. Every year is different. Last year at this time we had almost a foot of snow! The oak woodlands at Pleasant Valley Conservancy are getting more attention in our restoration work, so it seemed a good idea to update the web pages. I have added some new air photos prepared by GIS, and restructured the rest of the pages. Also added is a fairly extensive treatment of the roadside flora of County F. This roadcut has been an important source of seeds for our restoration work. Thanks to a 2011 Landowner Incentive Program (LIP) grant, we are able to do a lot more work on this fine oak woodlands. I am not too happy about the resolution of the above photo. It looks great in GIS, but the demands of the web don't permit use of the original (almost 4 MB in size). However, I think it shows well the contrast between the north-facing slope, where tree density is very high and the canopy is over 90% closed, and the south-facing savanna, where the canopy is only 20-50% closed. Double clicking on this photo will make it larger. Note the blue dotted line through the middle of the woods. This is a woods trail that we maintain and is open to anyone. As part of the LIP grant, our crew went through with brush cutters and herbicide and cleaned out the blow-downs and other annoying brush. It is strictly a walking trail, so don't expect a wide patch. We have actually had this trail for almost 30 years, but only recently have we had time to maintain it. Keep it in mind for next spring, especially in May, when the trilliums and large yellow lady slippers are in bloom. 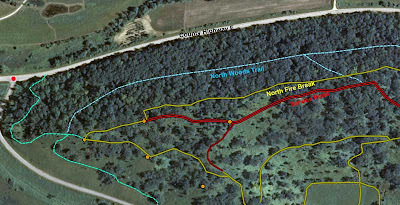 I have also restructured the material in the web pages on the woods burns. It's still not detailed, but does give an overview of what we are doing. We have now had several successful fall burns and are initiating a two-year cycle for these burns. Whether we'll be able to keep to that schedule will depend a lot on the fall weather. Although most of the County F road cut has been in good shape for years, we never were able to finish the last 500 feet until recently (photo above). This was a major November effort (thanks in part to the LIP grant). Amanda has now been clearing all the invasive shrubs in the woods above the road cut, and if we are blessed with reasonable weather, we may have this whole northeast corner cleared before spring. 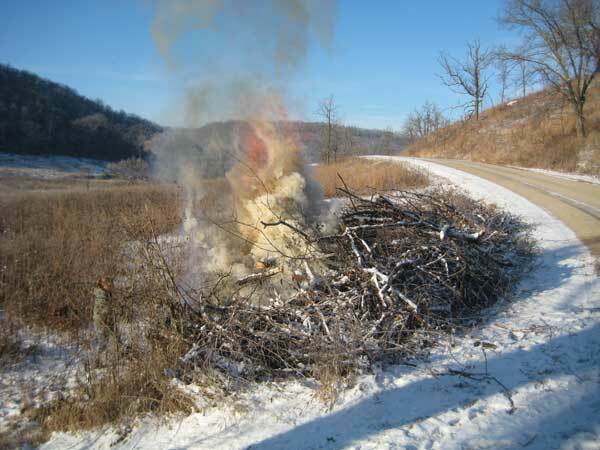 We had a nice light snow Friday night, making this an ideal time to burn a brush pile. We have been building one major pile since mid-summer and we generally burn it with the first snow. We have been building and burning this same pile along Pleasant Valley Road for the past five years. During summer, it mainly gets weeds such as sweet clover, wild parsnip, and hedge parsley, armloads that are too big to get rid of any other way. Garlic mustard would also be included if we had any to get rid of. These are flowering plants which might produce viable seed if allowed to lie on the ground. Therefore, we carefully throw them on the pile so that the seeds cannot spread. Alternatively, we bag them and throw the bags on the pile. In the fall, we have plenty of woody vegetation to throw on the same pile, and this provides good fuel for the burn. We build this pile right next to the town road, since that makes it easy for us to get rid of all the "bad" stuff, throwing from the back of the truck or utility vehicle. By Christmastime this pile is fairly large, and has lots of flammable material. Since this pile is right next to the Valley Prairie and just across the road from the Pocket Prairie, we need to wait for snow before we burn the pile, since both of these prairies have lots of flammable material. If we had a spot fire with each of them, a whole prairie might go up in flames. We don't need much snow, just enough to cover the ground. The main work in burning a brush pile is consolidating the brush, logs, and other plant material into the center. The goal is to end up with a small area of ashes alone. There is always a lot of wood that has rolled away from the burning pile. A pitchfork works well here, since pieces of burning wood can be lifted up and tossed back in the center. If a pitchfork is not available, a long-handled shovel can be used. 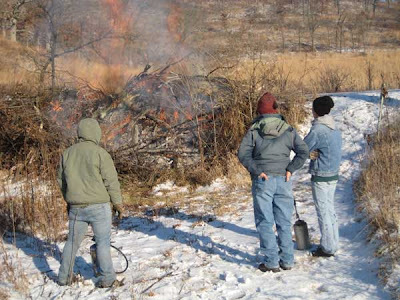 Because of the snow, there is no danger that the fire will spread out of the burn zone, so once the pile has been well consolidated, one can leave it smoldering. However, it is a good idea to check the pile before leaving for the day. One of the interesting phenomena with such a pile is that late next spring there may often be a zone of seedlings surrounding the area of the pile. These represent viable seeds that were just outside the hot zone and hence did not get killed by the fire. A glyphosate spray takes care of these seedlings. I have tried to keep careful notes of all our burns, and to a great extent I have been successful. Notes include maps of the proposed burn unit, a detailed narrative of each burn, a map of the results, and photos. In most cases, I have returned a day or two after the burn and walked the whole burn unit again, making notes and taking more photos. The window for doing fall burns is narrower than that for spring burns, although fall is often more favorable. This is because woodlands are usually on the north-facing slopes, and snow hangs on longer in the spring. In fact, once the snow does melt, the spring flora comes up quickly. Burns at that time will set everything back. The ideal weather for a fall burn is that delightful period called Indian summer. This is the warm spell that succeeds one or two hard freezes. 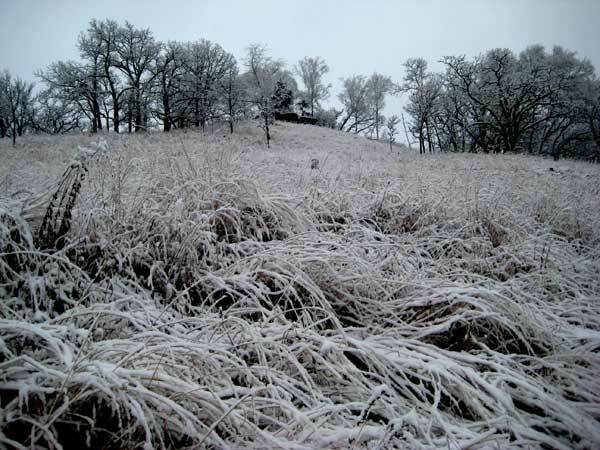 The freezes help bring the oak leaves down, and the warm spell brings on a favorable temperature and low humidity. For instance, on the savanna burn we did 6 November 2004, the temperature at 2 PM was 75-78 F and the R.H. was 18-20%. There were no clouds and the air was clear and sunny. Ideal conditions for a burn! And we didn't need a permit! Native Americans burned every autumn, waiting for that spell of warm weather when the fire would carry well. This week IPAW (Invasive Plants Association of Wisconsin) held a nice symposium as part of the North Central Weed Science Society and the Midwest Invasive Plant Network. Three days of weeds, brush, invasive plants, herbicide physiology, corn, soybeans, and others. To see the program, follow this link. I gave a 30 minute paper entitled Buckthorn Ecology and Eradication, which summarized my work on buckthorn that has appeared in a number of Tom's Blog posts over the past several years. I plan to post the Power Point for this talk on my web site, once I get the file reformatted properly. Although skiers may be unhappy, this has been a great December for restorationists, and we have been able to do a lot of tasks now instead of in the spring. Yesterday, Kathie mowed the fire breaks at Black Earth Rettenmund Prairie. The burn at this prairie is fairly complicated, so we like to get it done early. Getting the fire breaks mowed the previous season makes a lot of sense. 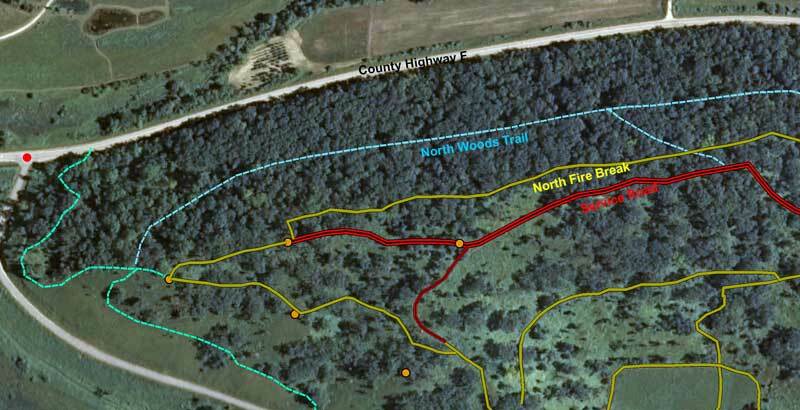 We have three burn units at Rettenmund Prairie, north, south, and saddle. Because the south unit still has a significant brush problem (a legacy of years of neglect), we burn it every year. The north unit and saddle are burned in alternate years. Last year we did not burn the saddle, and burned both the north and south units. Because these two are separated by the saddle, we did two separate burns. This year the north is being given a rest, so that the south and saddle can be burned together. Thus, this coming year we will only have a single burn. This simplifies the fire break situation, since we need to only have a single break. We use our small Kubota tractor to mow the breaks. 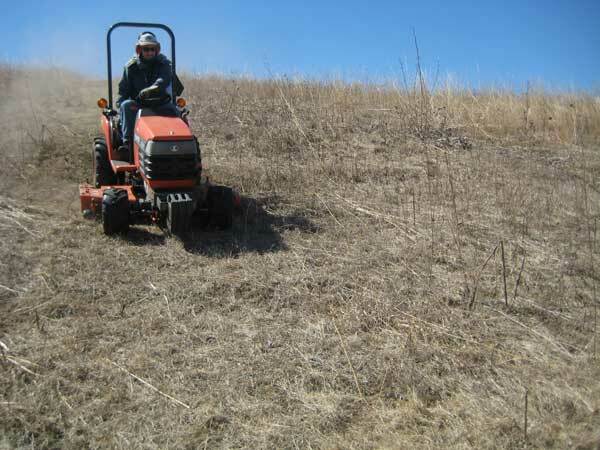 This little gem is ideal for prairie fire breaks, as the photo shows. 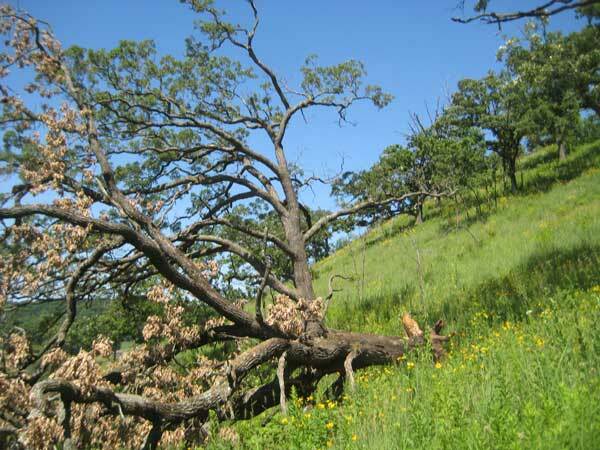 Last summer we lost a large bur oak on our south-facing slope. See last July's post for details. Unfortunately, as the July photo above shows, this tree fell in a dangerous spot, and presented a considerable hazard for next spring's burn of the south slope. We could not leave it lying. 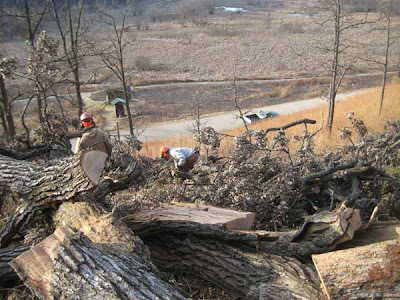 We waited until the prairie had senesced and the tree had time to "age" before dealing with it. Yesterday, Integrated Restorations came in with chain saws and cleaned up the site. Even though the big tree was down, it was a major job to cut because it was not completely on the ground. As last summer's photo shows, the branches were still high in the air. 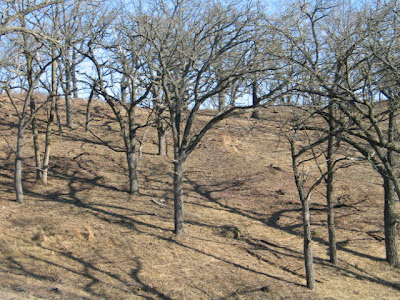 The wood of a bur oak is dense and hence very heavy. Cutting such a tree down is not a trivial task. Obviously, we left it for the professionals. As the photo above shows, there was lots of wood here, and the site was up the hill from the town road (Pleasant Valley Road). The crew cut up all the small stuff and made a brush pile. The big wood was cut into pieces, rolled down the hill, and taken to the cabin, where Craig split it with an axe. We now have enough fire wood for the rest of the winter. 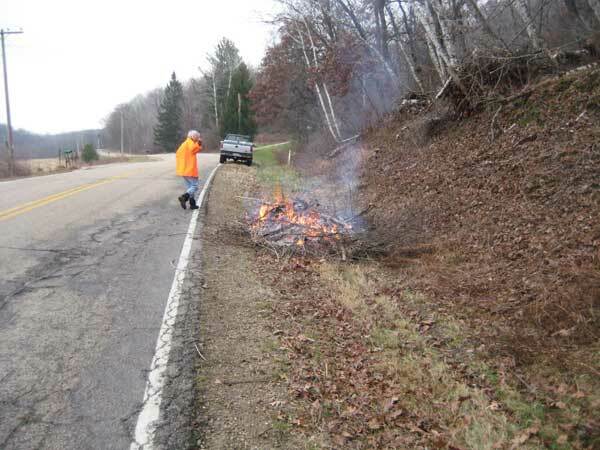 The brush pile was placed in a location where its flames would not damage any nearby trees. (Dry brush piles burn especially hot and create high flames.) This brush pile will almost certainly burn up when we burn the south-slope prairie this spring. The photo here also shows down the hill the still-black Crane Prairie which we burned a few weeks ago. In addition to Pleasant Valley Conservancy, Kathie and I (together with Willis Brown) are the stewards of Black Earth Rettenmund Prairie, a Prairie Enthusiasts (TPE) site. This small but high-quality prairie is quite well known and folks come from all over to see it. The wood lily bloom each year in the middle of June is famous, but the prairie is fine anytime of the year. Although a lot of the changes were cosmetic, the whole site was restructured to make it easier to follow. Also, I updated all the stewardship material, since there had been quite a few changes. If you haven't accessed this web site in a while, you might find it interesting to read again now. One stewardship job we are making great progress is sumac control. We have hopes that with consistent attention over the next two or three years we will have it eradicated. In mid October, I used GPS to locate all the remaining sumac clones (the red leaves in the fall make the plants easy to spot). Using GIS, I generated a new map showing the locations of the 16 sumac clones I found. Rex, who we hired for this job, basal barked every stem of every clone. We undoubtedly missed some stems, but we'll be back next year (and the year after, etc.) to get them. My web site (PleasantValleyConservancy.org) is apparently widely read, and I continue to get comments from across Wisconsin and the Midwest. However, any web site gets "stale" after a while, and needs updating. Now that our field work is tapering off, I have had some time to work on it. The Home page in particular had become a bit of a mess. I kept adding new things more or less willy nilly, and it was confusing to know where to go. So I completely redesigned the page. I kept enough introductory material so that new comers would be able to get oriented but I also added a box near the top that announces which web pages have been updated. And of course, Tom's Blog (which you are now reading) provides up-to-the-minute information. The Menu bar on the left side of the page has also been modified. And two new pages have been added, one on Awards and Recognitions, the other on the East Basin. The latter complements the three blog posts that were published in November (Turning woods into prairie, parts 1, 2, and 3). None of this is any big deal, but some people might like to know what is happening.